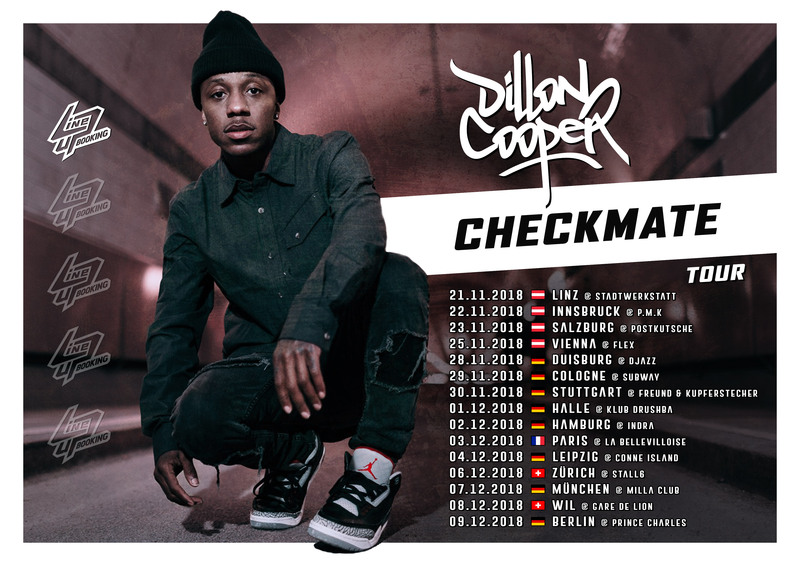 At just 21 years old, rapper Dillon Cooper is already taking the world by storm with his startling combination of fresh beats, lyrical prowess, dynamic, energetic flow and his own brand of cool style. Without a doubt, this New York native is set to become a permanent fixture on America’s musical landscape. Born and raised in Crown Heights, Brooklyn, to immigrant parents from the Caribbean, Cooper’s passion for music began at an early age. “I love music. I’ve always loved music. I’ve listened to music my whole life,” he says with a knowing smile which tells you that making music is exactly what Dillon Cooper was born to do. Cooper didn’t start off as a rapper though. In fact, he is a serious musician who played the piano as a child before picking up the guitar at the tender age of seven, continuing through childhood and then more seriously in his teens. “I just thought the guitar was a cool instrument that I wanted to play at that age,” he explains. He was so good at the guitar that his talent led to a place at the prestigious Berklee School of Music in Boston – home to such musical luminaries as super producer Quincy Jones. However, it was just a few semesters after enrolling that Cooper knew he had to quit. “School really just wasn’t for me,” he admits. A chance conversation with musical star John Mayer, who’d gone to talk to the college’s freshmen students, solidified his decision. Cooper asked Mayer what he would do if he disliked college. Mayer’s words of wisdom were: “I would just leave”. Cooper took Mayer’s word for it and he hasn’t looked back since. Although Dillon Cooper’s earliest forays into rap had been “just for fun” he knew he had to take his gift to the next level especially if he wanted to stand out from the other guitarists around him. He started recording demos with a host of local and international producers and eventually shot a video, set in Brooklyn, to Shadows, the track that established him as a force to be reckoned with and got the music industry to sit up and notice this fresh-faced wonder. After posting the video to his Facebook and YouTube pages, Shadows went viral online. It was then brought to the attention of legendary rapper Jadakiss who loved the song and posted it on his blog SoRaspy.com as well as throwing in a retweet! Things took off from there. Cooper started racking up thousands of views online and has been developing a strong and loyal fan base from all over the world ever since. Cooper thinks a lot about his audience and how his music will impact them. Despite his young age, Cooper’s music is timeless, inspired by the personal and the political: “Generally, I just try to talk about stuff that I’ve been through and that I’m going through which older people can relate to because they’ve been through it and people who are my age can relate to because they are going through the exact same thing or feel that same way because we’re in the same group. I try to put it in a way that anybody can latch onto and say ok, I get this”. Sonically, mix a little Kendrick Lamar and Drake; add a sprinkle of Lupe Fiasco’s conscious lyrical clarity and the urban edginess of A.S.A.P. Rocky then you’ll begin to get some idea of what Dillon Cooper sounds like. He brings an old school hip-hop vibe, with a new school hip-hop attitude, which is radio-friendly enough for everyone to enjoy. But while he counts a number of rappers as his influences and inspirations – “I love Jay-Z. I love Big L. J Cole is dope. Wale is dope. Eminem by far is one of my favorite rappers of all time….” – he is very much an individual. “I just want to bring me to the table.” And you can hear him, unmistakably, in everything he does. The rapper has already predicted his own future: “When I pay them loans back, and when I’m in them magazines, that’s when Berklee gonna send me that honorary degree” he rhymes. Many already believe him. Dillon Cooper may be only 21 years old, but his music stands with some of the best of what’s out there already. Sit back and enjoy the ride. Dillon Cooper is on his way to the top. schreibt seit 15 Jahren Raps, produziert Beats und hat in der Vergangenheit mit Hörspiel Crew, B-Seiten Sound, Mirac, Testa, Con und Atomique auf den Bühnen vieler namhafter Festivals und Clubs Österreichs performt. Auf über 35 offiziellen Veröffentlichungen vertreten, ist er Mitbetreiber des Duzz Down San-Labels und veranstaltet mit BLVZE Bassmusic-Parties in Wien. Sowohl beim Auflegen als auch beim Produzieren gilt seine Liebe vordergründig Bass-, Dub- und Grime-Sound. aktiv und tourte zuletzt als Gast-Vokalist der Berliner Reggae/Elektronik-Combo Illbilly HiTec um die halbe Welt, unvergessen sind viral gegangene Features mit Ruffian Rugged a.k.a Def Ill und General Levy oder Biga*Ranx. Vielseitigkeit ist bei ihm nicht nur ein billiger Slogan, sondern Programm: Egal ob Dancehall, HipHop, Dubstep oder Drum’n’Bass, KINETICAL weiß jeden Style zu meistern, solange die Musik auf Beats und Basslines basiert.